A growing audience on social media means automatically more responsibility. People look up to you and you become some kind of role model for them. That means you have the power to share your opinion, advice, and ideals with a huge number of people. For me, it also means that you are responsible to engage in social affairs and be part of a charity project. I want to support one person to becoming a pilot. I not only want to be the mentor for this future aviator and help him to pass the flight school successfully. Additionally, I want to support this person financially maybe even pay for the full training. But how will I be able to pay for that? Together with EIGHT 8R I designed my very first Pilot Patrick bracelet, called #aviatorbracelet. The unisex bracelet is available in navy blue and pink. The strap is out of parachute robe and the small aircraft with my logo is out of carbon. The adjustable strap guarantees a perfect fit for anybody. The #aviatorbracelet is handmade in Germany and is available worldwide. It has always been my matter of the heart. That way we are connected with the same bracelet and together we can realize ones dream to become a pilot. It now depends on YOU. This project is only possible with YOU and YOUR support! Who will be this Aviator? Once the project is successful I will inform you how you can apply to get the support for your flight training. 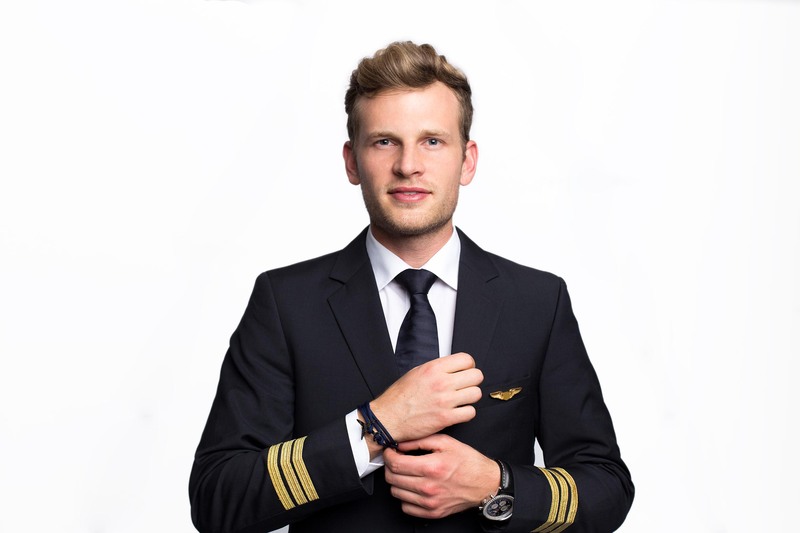 With my #aviatorbracelet I would like to support you in your dream to become a pilot! How to order the bracelet? The #aviatorbracelt is now on sale. The entire profits will go into the flight training of one future Aviator. Simply use the page below to purchase your bracelet. Choose the color, go to check out, fill in your address and pay with PayPal, credit card, and bank transfer. By German law, I am only allowed to show the check out process in German. Therefore you find on the right side an explanation of the address fields. Once you received my bracelet, please share a photo on your social media page. Tag me on the photo, so I will be able to see your post with the bracelet. USE: #aviatorbracelet #pilotpatrick @pilotpatrick in your caption to spread my project and to make it a successful charity. Additionally, you have the chance win a skype call with me when you share a post! Order the bracelet HERE! (Follow the step by step instructions from above! If you have questions regarding the ordering process please send an e-mail to: info@eight-8r.com or send the shop a message on Facebook or Instagram!